Hellbound Media to launch Shock Value 3 at ICE! SMALL press comic publisher Hellbound Media is set to launch the third in its popular Shock Value series of horror anthologies in Birmingham this weekend. Shock Value 3, or Shock Value Green as it is known due to the colour palette of its distinctive cover by Mandy the the Monster artist Anna Pennlund. The anthology contains comic strips that look, according to Hellbound Media co-founder Mark Adams, “look at the dark side of human nature, exploring both the supernatural and the evil found in human nature itself”. Most of the strips are written by Hellbound Media founders Matt Warner and Mark Adams, with an additional story by guest writer Jamie Lambert of Dexter’s Half Dozen fame with art by New Wasteland Fairy Tales creator David Powell. Shock Value Green also features Shock Value’s first prose story by Chrissey Harrison. Shock Value value features Sunday Drive featuring the Dawn Keenan, Hellbound Media’s foul-mouthed Dublin vampire hunter character that featured in one of the company’s first books, Kiss Me Deadly. Hellbound Media’s mascot Elle Bound also makes her first comic appearance in the rip-roaring adventure tale The Deadstar Diamond. Shock Value Green will be launched at ICE at the International Comics Expo in Birmingham on Saturday. 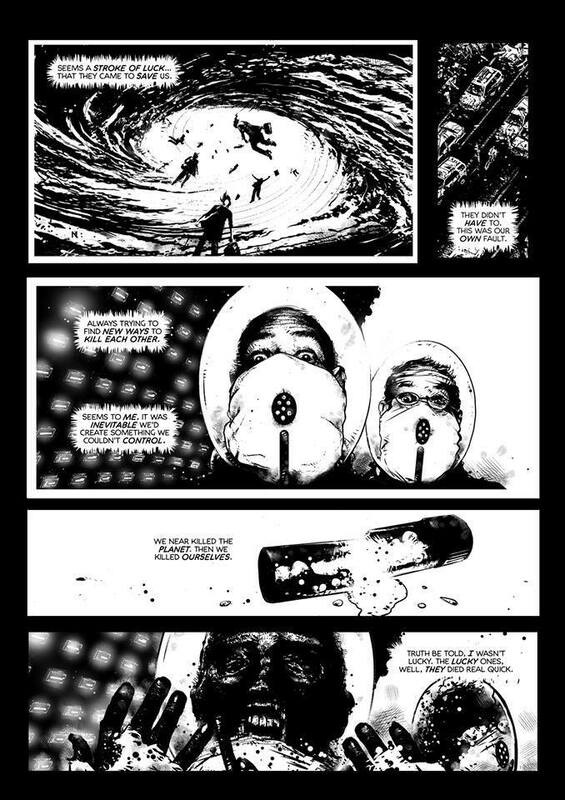 A page from the Shock Value 3 story The Undoing by Mark Adams, Neil McClements and Nikki Foxrobot.